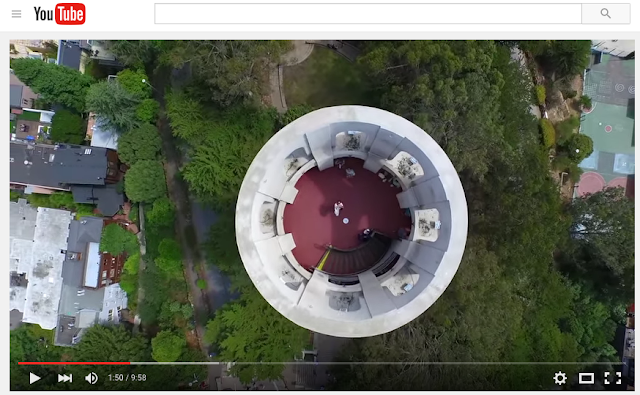 A brand new compilation of my favorite aerial videos footage from the last 2 years! B&H Photo has a new drone section in their store in New York City, and I was asked to create a compilation of all my favorite drone videos for them and Lexar to put on the 60" display there with the drones the memory cards. I went through all of my drone videos and built a compilation of my favorite video segments taken with DJI Phantom and Inspire 1 aerial cameras (drones). This compilation includes footage from the U.S., Canada, Switzerland, France, Italy, Monte Carlo, St. Thomas and Spain. I wanted to show a diverse cross section of my drone work, from sports to landscape and everything in between. It is a fairly long video (at 10 minutes), but I think you will agree that it is worth the watch. If you visit the B&H store, check out the drone section and say "Hey - I know who created that video!" The holidays are upon us and many people are adding photography gear to their wish lists. At this time of year I always get loads of email from people asking my opinion on cameras, lenses, printers, drones and other accessories. 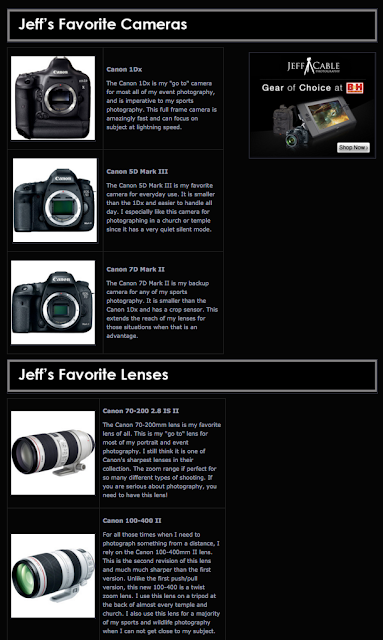 So...I decided to do a complete revamp of my "Favorite Gear" page and it is now live. You can check it out here, or by clicking on the image below. Hopefully this will help you pick out a new gift for yourself. I know that I have more camera gear on my wish list! You can not visit the city of Barcelona without seeing the architecture of Antoni Gaudi. If you saw the last blog post showing the Sagarda Familia church, you know that he was way ahead of his time. Today's blog post shows images of Casa Batllo, the home that Gaudi designed for himself in the heart of Barcelona and also includes images from the music palace, with it's spectacular stained glass work. Let's start with Casa Batllo. This is the view of the house from the street. it doesn't take much to notice that the architecture is totally unique from all the other surrounding buildings. In order to get a better photograph of the building (with less distortion), I walked across the street and took this shot of the mosaic covered walls, windows and unique balconies. With the exception of these first two exterior shots (which were taken with the Canon 28-300mm lens), all of of the photos in this blog post, were taken with the Canon 5D Mark III with the 24-105mm lens. This is the inside of the front windows that you see in the first photo of this blog. Gaudi used a lot of shapes and colors in his modernism designs. And this is a view of the inside of the building, which is at least 4 stories down from a large skylight. This shaft of light helped light the home from the inside, since most of the exterior walls were connected to other buildings and would not let any light in. I saw this unique stairway and had to take a shot. Gaudi rarely used straight lines in his architecture. Here is another view of the inner shaft of the home. Even the design of the roof was unique. I moved to different spots to photograph this roof from different perspectives. I love the curves and monochromatic style of this hallway. It is so different from anything I have ever seen. This is yet another view of the inside of the home, but this is my favorite of the three. Since this was close to the skylight, there was an abundance of light to show off the deep blue colors in the tiles. I could have positioned the camera up over the glass, but instead, I stood back and included the glass in this composition. I love the way the curves in the glass work against the geometric tiles in the top part of the frame. After touring the Casa Batllo, I made my way over to the Palau de la Musica. I had seen photos of this building and really wanted to capture photos inside. As it turns out, the only way to get into the building is to take a guided tour. I waited 30 minutes for an English speaking tour and then entered this amazing building. While the tour guide was talking to all the people in one of the rooms, I made my way outside to get an unobstructed view of these columns. And since the guide was still keeping the people busy, I made my way into the main room. This is the room that I so wanted to capture in my camera! And yes, it is true, I was too busy taking photos to listen to most of the tour. It is easy to be captivated by the stained glass, but I wanted to make sure to capture some of the other details of the building. At this point, the tour had moved into the main theatre, so I focused on different areas of the walls and ceiling. This is a photo looking straight up at the stained glass window directly in the center of the theatre. And here is a tighter shot to show the level of detail in the glasswork. And then I waited for everyone to move out of the room, to capture this photo. The only thing that disappointed me was the construction that was going on to the right of the theatre. All that scaffolding and people. But, as I looked at the scene, I noticed to perfect symmetry of both sides of the theatre. I figured that I could take the windows and chairs from the left side of the theatre, copy them, and then flip them and paste them into the right side of the photo. Because the columns, chairs and even the outside walls were identical, I was able to do so fairly easily! And this photo is the end result. This is one of my favorite photos from the week in Barcelona. Most of the photos I had seen of the Palau de le Musica were taken from the straight on position. So in order to get something a little more unique I moved to the side of the theatre to get this perspective. This was also my "safe shot", avoiding the construction, in case I was not able to easily fix the others shots above. Stay tuned for one more post from Barcelona... A visit to Guell Park. This weeks blog post is the second post with images from my recent trip to Barcelona, and today's subject is the famous Sagrada Familia church designed by Antoni Gaudi. Come along and join me for a virtual tour of this amazing building. This is your typical photo of the outside of the building. Normally I hate taking photos of buildings surrounded by cranes and construction materials, but this is different. Why? Because one of the unique things about Sagrada Familia is that it has been under construction since 1882. And...after more than 100 years, it is almost complete. I started with the wide shot of the basilica to show you the size and scale of the building, but I still prefer the tighter shots showing more of the detail of the architecture. For this photo, I walked a block away and framed the church with the trees in the foreground. Here is another photo of the church from the side, also including some of the fall colors in a nearby tree. If you know me, you know that I like shooting photos that are different from what most others are taking. When walking around the front of the church, I saw these panels of glass on the adjacent gift shop. There was no reflection of the building from where I stood, but as I walked closer to the glass, the Sagrada Familia came into view. And this is what I was looking for! At the time, I was using my Canon 5D Mark III with the Canon 28-300mm lens. This allowed me to shoot both wide shots and tight shots (like this one). From these first three photos, you might think that Sagrada Familia is similar to all the other churches in Europe, but this is definitely not the case. As you enter the front of the church, it is apparent that this is not your typical European architecture. This is a column by the front door, which in itself looks different. And you can see the colored metal leaves which frame the entry. But if you think the front is different, check out the other side of the church! The back side of the Sagrada Familia is much more modern than the front. If you did not know any better, you would swear that this is a different building. Gaudi died with only 25% of the construction complete, but he left his designs for the entire building so that others could complete the building. During the Spanish Civil War in 1936, those designs were burned, but construction continues. Some of the plans were saved but some of the design is left to the interpretation of current architects. That is obvious in these photos. As I walked back into the church (from the back side), I noticed these amazing doors. I switched to my Canon 24-105mm lens and got really close to one of the doors. I stood and photographed the door at an angle, which creates lines which lead you through the photo. And then it was time to take the elevator up to the top. From the top, you have a sweeping view of Barcelona. And this high vantage point also gave me a close up view of some of the newer architecture that is still being constructed. I had the option of taking the elevator or taking the circular staircase all the way down. Gotta take the stairs of course! I had one of the guys from our group look back up at me for this shot. As you can tell, the circular staircase makes for a really cool frame. Now let's take a look at the inside of the building. Once again, you can see that this is not your typical architecture. Each of the columns is made to represent a tree with branches coming from the top. On each of the columns you can see colorful mosaic work. Here is a better view looking up towards the ceiling of Sagrada Familia. And a tighter shot of the mosaic work in the ceiling. I love the wonderful use of color. Like so many of the old European churches, the stained glass work is breathtaking. There is a wide variety of colors used within the basilica. Again, searching for something different. I looked away from the stained glass windows and saw the light reflecting off of the organ pipes. I stopped the camera down by a full stop to darken this image and draw more attention to the reflecting colors on the bottom of the pipes. Most of the people in the church were fixated on the stained glass windows, but very few were taking photos of the colors that were cast onto the inside columns and ceiling. This was one of my favorite photos from inside the Sagrada Familia. I was teaching people to look beyond the obvious, and find the "hidden beauty" in this building when I pointed out the different colors being cast on each individual column. None of them had noticed this, but I sure did. This is what a decade of photography has done to me. It has helped me see beauty in so many things that I would have been blind to previously.